The Brother HL5350DNLT is a reliable monochrome laser printer which is a suitable choice for printer-sharing working environments with heavy printing needs. The printer is compact in size as it measures approximately 371 x 384 x 347 mm and weighs around 9.5 kg. The printer also features automatic duplex printing for printing on both sides of the paper. This can help reduce business costs, the carbon footprint and beneficial for the users who do not prefer to waste paper. The processor is 300 MHz capacity and it takes 8.5 Seconds to print the first page.The printer is designed for networking and comes standard with a 500-sheet paper capacity. This makes high-volume print tasks easier to accomplish with Brother HL5350DNLT Toner Cartridges. The printing resolution is 1200x1200 dpi. 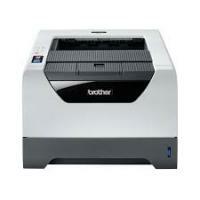 The printer uses high page yield toners and can print at decent speeds up to 30 ppm. Printing at such speed can increase the productivity of any requirement. It incorporates features like auto duplexing and built in networking. This compensates its lack of colour printing and wireless connectivity. It gives out clear and consistent images and offers reliable operation. The Brother HL5350DNLT offers good connectivity options and is network-ready. This makes it a good choice for busy office settings and workgroup environments. It also has an auto duplex unit. As the printer does not support colour printing, the office environments that need a more versatile printer may not find it a suitable option.